The beginning of the year is always a great time to go to the cinema, as the films coming out are often competing for big awards. 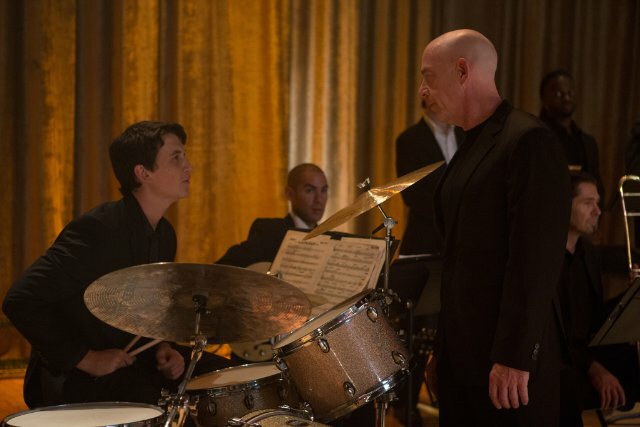 Nominated for the Best Picture Oscar is Whiplash, directed by Damien Chazelle, who has only just turned 30. Snubbed in every possible way by the Academy but Best Film of the Year winner at the National Board of Review is A Most Violent Year, directed by J.C. Chandor. Let’s start with the boldly directed jazz thriller Whiplash. It introduces us to young drummer Andrew, who is just starting out at the prestigious (but fictitious) Shaffer Conservatory. One day, he is asked to join mysterious and dictatorial professor Fletcher’s studio band and becomes addicted to the idea of greatness, a word he so wants to be associated with. Artists know that getting to the top and being the best takes a tremendous amount of hard work. This idea however becomes somewhat twisted when in the hands of Fletcher. All the teacher wants is to discover greatness in his studio, but he humiliates and frightens his students in this aim. How much is too much? “There are no two words more harmful than: Good Job”, and this is so true. Fletcher says this when showing his more human side. You do want to warn Andrew, though: a smile exchanged between the two can only lead to catastrophy. Indeed, what I would say characterises Andrew’s feelings for Fletcher is addiction, and perhaps the opposite is also true. He is addicted to this “thumbs up” or slight smile that he could receive from Fletcher once every few months, even though he knows that that smile only means danger. J.K. Simmons, who seems like such a nice man in real life, is excellent as an obsessed and abusive teacher. Miles Teller also shows so much commitment to the drumming and his role that the actor seems set for many different kinds of roles in the future. Credit also goes to cinematographer Sharone Meir and musician Justin Hurwitz for bringing out the musicality of the streets and buildings of New York City (also explored in Birdman and Begin Again) and creating a battle-like relationship between the two protagonists. Another thrilling picture this month is A Most Violent Year, directed by the impressive J.C. Chandor and starring Oscar Isaac, Jessica Chastain and David Oyelowo, to name just a few members of the great ensemble. 1981 was the “most violent year” in New York City’s history, with violent crimes appearing to happen everyday. One method of defending oneself seemed to be the gun, but Abel (Isaac), who is a heating oil salesman about to make his business thrive, refuses to associate guns with his company. While his competition threatens his business through various acts of violence, he still refuses to defend himself in this way, especially as the the district attorney (Oyelowo) is about to start searching his house. The specificity of the topic may make this film look independent, but the techniques employed by Chandor, his cinematographer Bradford Young and musician Alex Ebert create more tension than felt in many films of this kind. Is it me or were the gunshots particularly loud? It is noticed quite quickly that Young went for a a lot of yellow and pale light during daytime and chose to use very little light for night scenes while sticking to shades of yellow and orange. Ebert also chose to blend his score with transportation devices like trains and trucks, a characteristic which the film may have in common with Whiplash. The acting in this film is fantastic all around. While the script is dense, one doesn’t feel that too much talking is taking place. Oyelowo is calm, discrete but always focused as the DA. Albert Brooks was unrecognisable to me as Abel’s lawyer and perhaps second father. Chastain and Isaac were fantastic together as the heads of the company and the parents of two girls. Anna, the daughter of a mobster, is supportive of her husband no matter what, although the thought of power and perhaps violence motivates her as well. While she shows herself as an elegant and well brought up woman, she still says sentences like “That went good” and lets her Brooklyn accent come out when angry. Abel’s subtle Latin American accent was also a very distinct choice, which told so much about the character’s back story. This film was filled with little details of this kind. As it turns out, danger does not go away if you have a gun. On the contrary, you may attract it even more, and bring others down with you if you don’t have a permit. Anna, as we learn, doesn’t like violence that much after all. A Most Violent Year deserves so much praise for standing the gangster genre on its head, for not including too much lingo in this unusual script, and for such precision in every department. This is the first time I’m writing about music because, unfortunately, I can’t keep up with today’s music scene. But I do know about performance, so after attending one of Justin Timberlake’s 2014 London concerts last night, I have more to say than usual. It doesn’t hurt that since JT’s first album Justified came out in 2002, he has remained my favourite pop star. When a new album comes out and it’s time to go on tour, the singer’s first goal is hopefully to offer the audience an experience that takes the album to a new level, with new warmth and spirit. JT’s 20/20 Experience Tour brings this goal forward with its title alone, creating an audiovisual experience for the audience to fully welcome him back after too long years of absence. It’s no surprise: JT has matured. He appears in a black and white “suit and tie” in front of a vintage microphone and smoothly slips into a jazzy remake of “Pusher Love Girl”. His voice is clear, strong, striking. While the concert’s visual theme is largely black and white, I would have liked to see more risk in JT’s outfits, especially regarding colours and accessories. Furthermore, based on the 20/20 theme, I at first expected more visual effects on the back screen, but when you come to think of it, what he did was centre our attention on him and what was real rather than virtual. This is where we understand his intention to mix old and new. When I saw him last at Paris Bercy nine years ago, he surprised with the amount of dancing and simultaneous singing. This time, there is less movement, although it is evident that the artist loves short and sweet hip hop sequences, accompanied by his background dancers. The comparison with Michael Jackson is inevitable. What we noticed across the long slim mobile stage, which would later float over the audience, was the importance of the individual dancers and background artists. Although JT was the star, his accompaniment was treated with equal attention. This was highlighted by the camera focuses for example, and the choreography choices. What is more, I wouldn’t say that JT ever takes himself too seriously. On the contrary, many of his lyrics and comments during his show are filled with irony. He may trick the audience in calling him “My love!” during his famous song from FutureSex LoveSounds, but his generosity towards the crowds and his collaborators is palpable throughout. He also pays tribute to Elvis Presley and Michael Jackson who inspired his music throughout the years. Now that JT has dozens of great songs to choose from to form his set, it’s no wonder that he likes to play and blend them together. The switches from “Gimme what I don’t know” to “Rock your body”, as well as from “Sexyback” to “Mirrors” during the finale were superb. While he is evolving and new musical rhythms enter his repertoire, the party boy is always there. I do not doubt that he will be around for decades, hopefully choosing smaller venues at times rather than arenas, to connect even more closely with the audiences that started following him in their teens and are enjoying to grow older with him.